Last weekend was my first time to Simple things (Простые вещи) Moscow restaurant. It positions itself as a wine bar or gastropub and that's exactly what it is. 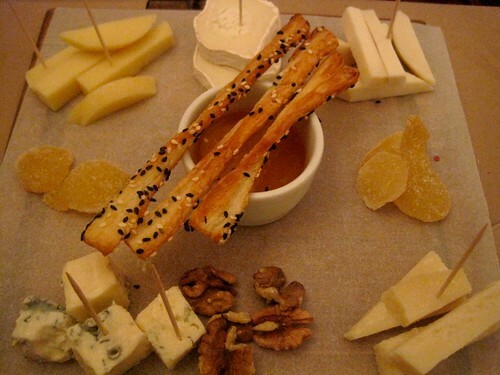 You get a good choice of wines and simple crispy fresh French and Italian food to complement it. We enjoyed it a lot. We visited their newly opened second branch (Простые вещи - 2) on B. Nikitskaya street 14. I felt happy once I entered the small cellar-like dining hall and set at a table covered with dark yellow paper looking at the welcome "sit for a glass of wine" stamped on it. I relaxed listening to quietly playing "La vie en rose" and studying the menu. My friends came and we got a bottle of French Cotes du Rhone. It was so deeply red in the large beautiful glasses. It felt a bit like Paris. Yes, I seem to start missing Paris now. The wine appetizers menu is very catchy. Just impossible to pass by their "wine set" (olives, dried tomatoes and pickled sweet peppers with crispy slices of baguette). We also got the cheese platter. Can't say anything about its authenticity or balance or whatever the cheese platter should display. From my last year in France I only got that there is no right way to compose it. It just has to be done with good taste and this one was. The onion soup, which I also miss so much, was very good. Zucchini with porcini and tomato salsa. Very tender and flavorful. And pretty, aren't they? Not too hungry that evening, we didn't come to try most of the food in Простые вещи. I do feel like coming back for another bottle of wine with their camembert crostini, porcini risotto, pasta with tomatoes and olives and surely another cheese platter. A month later I also got a chance to visit the older first branch of Простые вещи on Konushkovskaya street 32. It also has a pleasant atmosphere, which feels somewhat different as it has windows apart from the wine cellar-like second branch. At first we were a bit upset as it turned out the menus are a bit different and the first branch doesn't offer the wine set. However then we picked some other food and really enjoyed it. 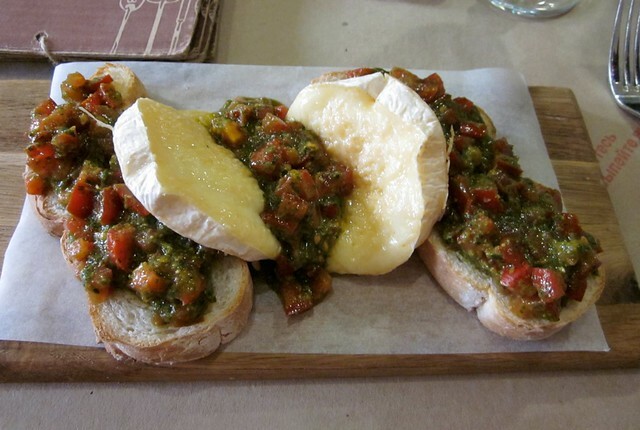 I was absolutely amazed by this bruschetta with camembert - delicious warm ciabatta slices topped with tomatoes, aromatic greens and warm slices of camembert cheese.